I love chocolate chip cookies, but can't make them because I just don't have the knack. So, I'm forced to make due with brownies, because they aren't too hard to make. Stupid brownies. Ever hear of caramine or carmic acid? Its an additive to give things like ice cream a red color. Its also made by grinding up a certain type of beetle's carapace. Martin! I was just craving a C.C.C. ! Oh yes, you are 100% right about making your own batch. I prefer mine with less chips than most people. The yummiest thing is to make your own dough and then stick it in some vanilla ice cream. Thanks for leaving me comments today!!! I never noticed the coconut, I guess it must be a cheap filler. Gosh, I'm so busy looking at sugar and calorie content, I never noticed things like coconut in there. I never buy chocolate chip cookies. I do make a mean one, if I do say so myself. I'm not much of a baker, but my Mom taught me to make those. In the entire blogosphere, there are few truly original things. But this may be one: a rant against chocolate chip cookies. Ingredient lists often scare me, but like Lora, I'm often too busy reading the nutritional information labels to notice. Besides, I've recently re-discovered that my Mom makes great chocolate chip cookies! She made the Toll House Squares when I was a kid, and that's what I remember. They were good, but damn her cookies are fantastic. Amy and I can't keep them in the house because we'll eat them all in like a day. 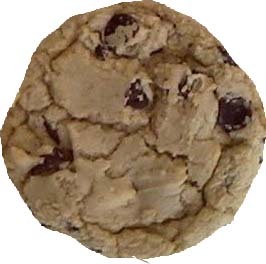 How can anyone think anything beyond "COOKIE!"?? ?